Graffiti by Danielle Notaro see correspondence elsewhere on Diana Mara Henry website. 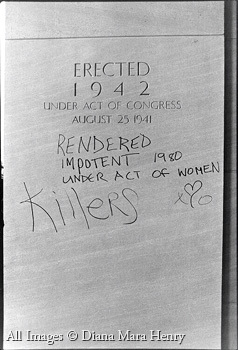 Inscription reads: 'Erected 1942 Under Act of Congress...Graffiti reads: "Killers...Rendered Impotent 1980 under act of Women.' Womens' Pentagon Action, November 16 and 17, 1980.